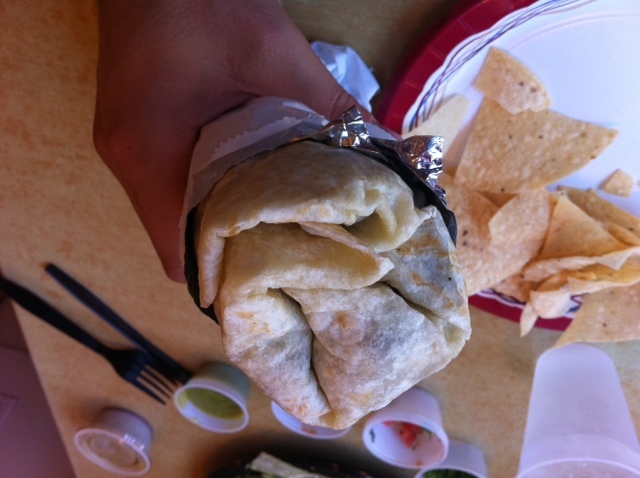 This is more of a burrito plus. Moving to a new place is never easy. Driving habits and living habits have to change, but more importantly, eating habits have to change. This can be easy for some, but when you have a meat blog it can be tough to say goodbye to the Taco Bell that once resided across the street. But it is also an opportunity to try new things, so as I woke up on my first real weekend in my new place, I realized it was time for a stroll around the area in search of food. Quickly, I found Taco Plus. Yes, I had driven by Taco Plus countless times in my life, but there are so many little nondescript taco places in LA, they all blur together eventually. Taco Plus is now no longer a blur to me, and is instead a local taco reality. But was that reality any good? 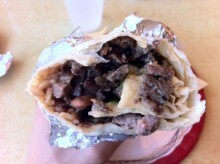 I ordered an old classic, the Burrito de Carne Asada. At $6.35, the price was competitive with the likes of Chipotle and I hoped the flavor could be even better. It came with the steak, beans, rice, cilantro and onions. As always, I ordered mine without onions to keep away from the veggies. I also noticed they had the option to turn the burrito wet for a buck or so more, but I wasn’t ready to eat so heavy with my first meal of the day. While waiting, I loaded up with some salsa from their salsa bar and after a couple minutes the burrito was ready. I bit right in and quickly found myself with a mouthful of steak. And good steak too. I could tell it had just been sliced up and wasn’t sitting in a tub somewhere waiting to be served. Plus, it was loaded with meat. This wasn’t some small dollop of steak, topped with a load of beans and rice for filler. This was a burrito made for a carnivore, with beans and rice just hanging out to enhance the experience. Yet, with all the meatiness, it wasn’t quite perfect. It still definitely needed the salsa from the salsa bar, because the steak itself wasn’t the most seasoned. I could definitely see where making the burrito wet would have made experience even better. So, did I find a replacement for Taco Bell? No, but no real Mexican food can truly replace Taco Bell. 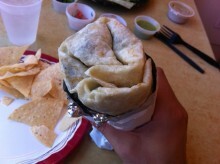 Instead, I found a pretty great burrito in a really great location. I can’t wait to go back and try out their wet burrito, because I have a feeling that cheese and sauce will make Taco Plus and A+. Sorry for the terrible pun, but you have to expect that when you name your restaurant that way.